In this chapter, we shall consider the output feedback H ∞ control problem of 2-D systems described by the Roesser model. 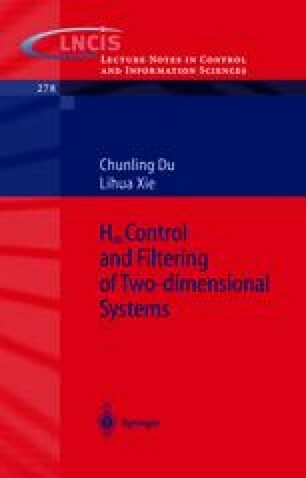 Based on the 2-D Bounded Real Lemma established in Chapter 2, the 2-D H ∞ controller design is formulated into a convex optimization problem characterized by LMIs. We further give a solution for robust stabilization of the 2-D system subject to a class of norm-bounded uncertainties. Also, two practical applications in thermal process control and processes expressed in Darboux equation are used to illustrate the solutions for the H ∞ control and robust stabilization.